The doctor will review any current vision problems, your general health, as well as discuss your hobbies and lifestyle requirements to better tailor the examination to your needs. 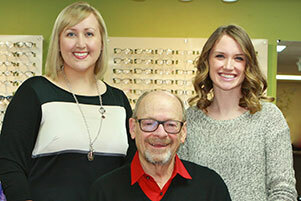 Because some eye conditions are hereditary you will also be asked about the health history of your immediate family. These questions will be asked during the portion of the examination when your prescription is established. The doctor will ask you to compare a series of lenses to determine which is clearer for you. As the differences become less noticeable, the doctor will be closer to finalizing your prescription. For this reason, if you’re having a hard time choosing between the options, it’s a good thing! Do I have to have the air puff test? No! The puff of air measures the fluid pressure in your eyes, known as intraocular pressure (IOP). This measure of pressure inside the eye is very important in determining your risk for glaucoma. IOP should be measured at least once a year in healthy adults. Glaucoma is a group of dangerous eye diseases that can cause permanent vision loss. You will be relieved to know that there are multiple ways to measure the pressure inside the eye that does not involve an air puff! We use state-of-the-art technology to make this dreaded part of your exam as easy as possible. Our iCare tonometer measures the intraocular pressure without eye drops or air puffs! The measurements take about 5 seconds per eye and you can blink the whole time! Watch in slow motion as the dramatic difference is demonstrated. Pupil dilation is not always necessary. The doctor will make this decision during your exam. If required, this painless process temporarily enlarges the pupil so the doctor can fully exam the retina. Dilation can help detect diseases like diabetes, high blood pressure and macular degeneration. If you have additional questions or concerns prior to your visit please feel free to contact us. Our friendly doctors and staff want you to be as relaxed and comfortable as possible during your visit. And remember, there are no bad questions. We welcome curiosity and encourage better knowledge of your eyes and vision!